In January, we got a Lego Mindstorm, so that I could start teaching my kids about robotics. Robotics is a great engineering project because it’s so multi-disciplinary. You need to learn about software programming, mechanics, hardware/electrical engineering, sensors and sensor error, tolerances, etc. And at the end of all that hard work, you usually end up with something that kind of does what you want it to do most of the time….. or some of the time as the case may be. Since we were in January, I thought we would enter in the RoboFest competition which was held in Monroe. If you win in Monroe, then you move on to the Championships in Michigan. Caleb invited his 4 close friends and we started meeting on Tuesday nights to start assembling the robot. 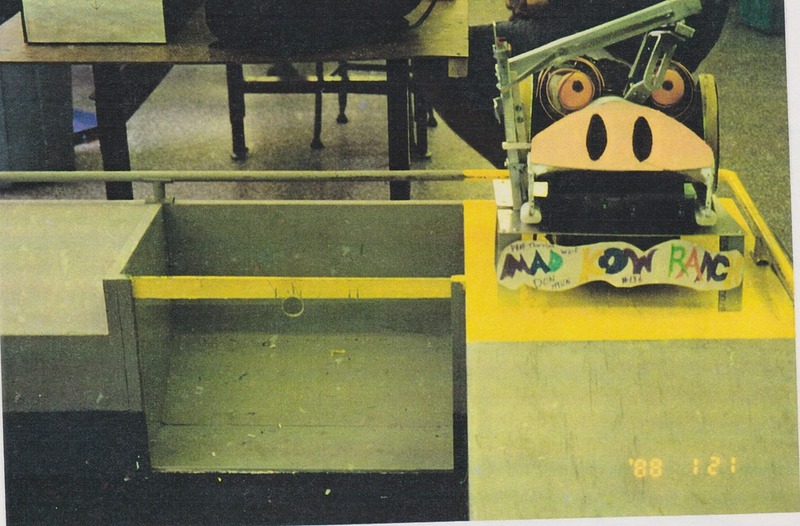 The goal of the competition was to create a “Bowling Robot.” You load up a tennis ball onto your robot at home base, then it is supposed to roll out to the bowling area, then somehow release the ball down a lane to knock over water bottles at the other end. After some discussion, we decided to use a gravity feed down a rail so that we can increase precision. We used a guiding wall and the edge of playing area to set our robot up perfectly every time. After meeting about 7 times on Tuesday nights, we had a robot that was working. On the Friday before the competition, the boys had a final meeting to make some final tweaks. By the time I got home from work, they reported that the Robot was working very well. They were talking about winning the competition and going to Michigan. The day of the competition finally came. We woke up early and made the drive to Monroe, WA. All the parents came to watch their kids in the competition. I was reminded that at a certain time, coaches were no longer allowed to help the teams. The kids needed to do the competition themselves. Our good friend, Karlin Kersavage, and his son, Krew, came out to cheer us on. I sat with them as we watched the kids prepare for the competition. They started testing their robot on the competition table. Immediately, the first thing we noticed was that the wheels were starting to spin out on the new table on the turns. Our robot does all the turns by odometry (by turning the wheels a certain amount), rather than by sensor. So, if the wheels start slipping, the robot will not turn enough. We had thought this may be a problem, so we had a few ideas to try and deal with this problem. First, the kids tried washing the wheels. This had worked previously on our practice table when we thought the wheels were getting a bit too dusty. On the competition table, when we washed the wheels, the wheels got even more slippery. Our idea #2, was to wash the wheels in some type of sugar soda. Caleb got some root beer and gave that a try. No luck. The wheels were still spinning. What we found was that the front sliding pads were not sliding as well on the new table surface. The friction co-efficient was different, so it was making the wheels spin out. We tried a few different options on the front pads like putting scotch tape on them to make them more slippery, but no luck. Eventually, we tried to increase the number of wheel turns to make up for the slippage, but this was going to cause a large amount of variance in how much the robot would turn, but at this point, we were running out of time and options. As the kids were playing with the number of wheel turns, the robot fell off the edge of the table and broke. Not just a little break. It broke into many, many, many pieces. There was only a few minutes left before the robots had to be impounded before the competition. The parents of our kids watched on in horror. The kids were frantically trying to piece the robot back together. But, the robot was too far broken to be fixed up in a few minutes. The time ran out. The organizer, (bless her heart), was kind enough to give our kids a little more time to re-assemble their robot. She saw how frustrated our kids were and had mercy on them. Some of the kids were on the verge of tears as they tried desperately to piece their robot back together. I felt for the kids and their desperation. I have never seen Caleb so focused. It was an expression between panic and persistence. I imagine brain surgeons have this look as they’re about to lose a patient and they quickly try to fix what was wrong with a prayer in their heart. It is a look we see in movies as a super-hero is desperately trying to save the day. This look was on several of the kids faces as they all did what they could to fix the robot. For me, at that moment, it didn’t really matter to me what the outcome of this competition was going to be. I got a glimpse of what my son was capable of when the world was burning down around him. He would desperately try to put out the fire. Sad to say, the efforts were not enough. They were able to put the robot back together, but not in its original configuration. When they came back to the bleachers, I told them that we may not get a chance to bowl, but we could still get some points by measuring a black square. (This is one of the first things that the robot needs to do). I told them that were other robots that were also having problems. If we can get a few points by accurately measuring the black square, then we would still have a chance. Needless to say, the kids were all disappointed. However, we found out that there was going to be a round 2. We were going to get another 30 minutes to re-calibrate our robot and try again. Hope returned to the kids faces. When the 30 minute recalibration phase started, the kids started putting together the robot again so that it was more sturdy. One of the kids, Joey, started reprogramming to get the turning right. When the 30 minutes was up, the robot was completely over-hauled. It was a little stronger. However, the programming was not complete. Joey continued to work on it after the robot was impounded. He told the team that he needed to reflash the robot, so nobody should push the go button on the robot, when they start. It was their turn again for Round 2. 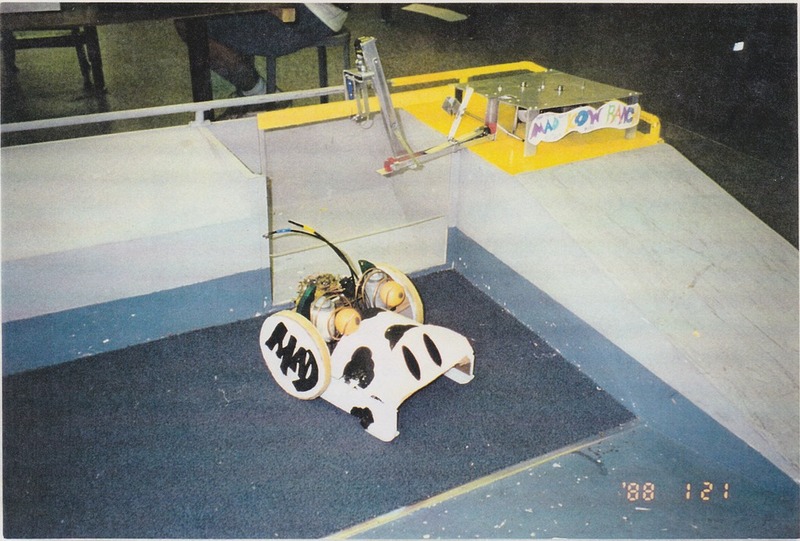 In this round, Joey was ready to reflash and pushed the code from the computer to the robot. While he was doing this, the “Go” button on the robot was pressed which wasn’t supposed to happen. The robot started lurching forward. 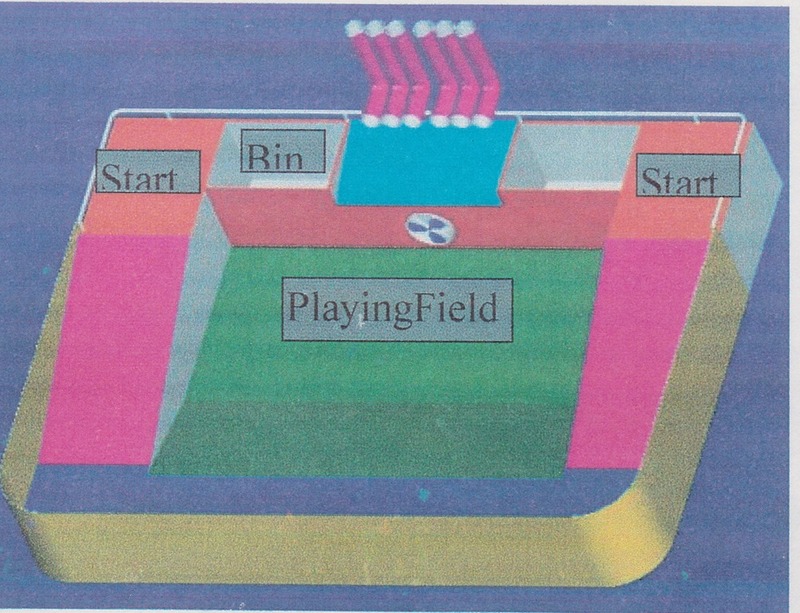 Then the robot stopped in the middle of the playing field and got reprogrammed and started over again. The robot ended up running off the edge of the table. The rails broke off of the robot. After some minor adjustments, they tried again, but the rails would not stay on. They were able to accurately measure the black square this time. However, they were not able to get the robot into the bowling area. They ended up getting 3rd place out of 4 in the 2nd Round, but got last overall. There were some tears. There were some hurt feelings. There was definitely disappointment. As we were sitting there on the bleachers, I let them know that this is not where the story needs to end. That all great people have bags full of stories like this. Stories of failure. And although I’m not necessarily a great person, stories of failure happen to be my specialty. I told them about my first robotics competition. It was at MIT. It was a class called 2.007. (All classes at MIT are numbers… I’m sure the class has a name, too, but nobody calls it by the name.. ) This competition is probably one of the biggest events at the school. I remember that the year I was competing, the competition filled the biggest lecture hall on campus. It was literally standing room only and the people were lined up and packed in all along the aisles of the lecture hall. Once you were in, there was no leaving. There were drums and horns blaring. The atmosphere was like a big football game at a “normal” college. The robot game was to sweep up a bunch of ping pong balls and then climbing up a ramp to dump them into a bin from the top. However, these bins had a sliding plexi-glass door on the side that slid upward. If you were somehow able to slide up the plexi-glass door, you could just shove all the ping pong balls into the bin rather than taking it up the ramp and dumping them in at the top. Out of about 30-40 competitors, I was the only person working on a mechanism to lift up the plexi-glass door. It was all spring loaded and worked kind of like a mouse trap. An arm fell down on to the top of the glass door. When the arm hooked on to the hole in the plexiglass door, it would automatically trigger a mousetrap type mechanism that would spring the door upward and open. It worked about 75% of the time. But, when it did – it was awesome. Then, I had a car in the shape of a cow. This was the time that there was the mad cow epidemic in England. My cow car had spiral eyes and holstein spots. It even had a cow-pie that it was supposed to release in front of the other competitor as a “land mine” of sorts. I carefully lined up my door lifter mechanism, then put my cow car on top. When the judge gave the signal to go, the door lifter arm fell onto the sliding door. There was a loud snap, and it pulled the bin door up perfectly! There was an admiring “ooooooooo” from the audience and then applause. But, just as suddenly as the applause started, it stopped with an “awwwwwww” of disappointment. In my excitement, I had jumped my cow car off of the starting platform and it flipped upside down. For the remainder of the competition, there was nothing more I could do. My cow car laid prostrate. I released my cow pie…. and that was the end. I had spent 3 months on that projects. More than 70% of my time that semester went to building out this robot at the expense of all my other classes. And this is how it ended – in 3 seconds of udder disappointment. I spent the a week after that in a mild depression. I didn’t go to classes. I just laid in bed. All I could think about was what I could have done differently. How I could have designed that cow not to have flipped. How I could have gently drove off the starting platform. There was almost no limit to my list of ideas of what I could have done differently. Then finally, on the next weekend, I decided I needed to stop doing this to myself. I told myself I will never regret again. I did my best, and that’s all I could do. Next time, I know what I need to do differently, but at this point, there is no good that will come out of second guessing what I did or did not do for the last competition. That was probably one of the best lessons I’ve learned in my life and I feel lucky I learned it early. 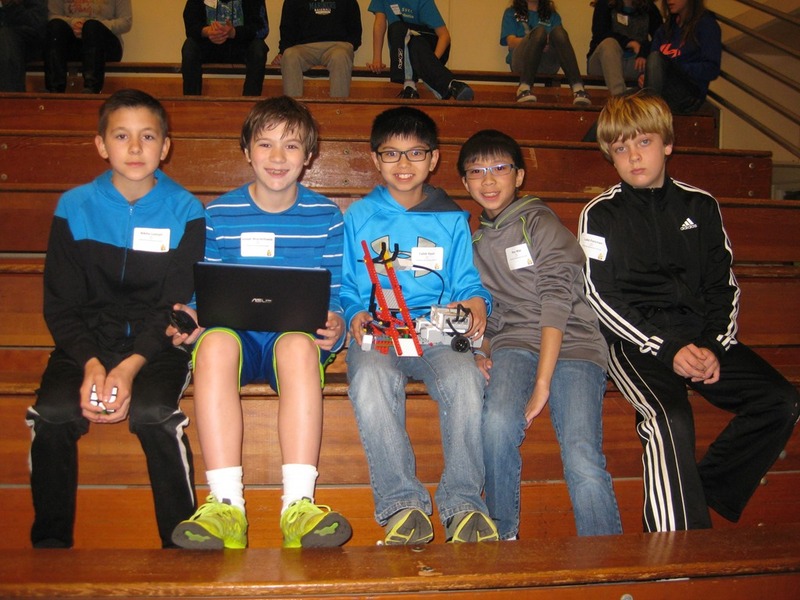 This was the first time I coached a robotics team. Admittedly, I can do much better. 1. Not all kids had the same level of skills and interest in making a robot. Some of the kids naturally started investigating and experimenting on their own. Others were there to hang out with friends, but didn’t have an instinctive desire to start playing with the components. Because we only had about 7 sessions, I couldn’t methodically teach lessons on various principles of engineering. We had to start designing and building from Day 1. This was difficult for kids that didn’t naturally want to engage in the problem solving discussions. 2. The team was made up of 5 kids and that was at least 2 too many kids. I only had one robot, and 2 laptops. For kids to learn and play with robots, everyone needs to be getting their hands dirty. Ideally, future teams would be 2-3 kids so that they can be hands-on. Even if all the kids wanted to be engaged in building robots, I didn’t have enough stuff for all the kids to be doing. This exacerbated the problem of the kids that were less interested, because then they would passively be pushed aside. I’d rather run multiple smaller teams with more equipment than have half the team sit and be disengaged. Everyone should actively solving a problem. 3. Robots are hard. Once a week for 7 weeks was not enough. I think we needed multiple nights per week for a couple hours to make sure to teach fundamentals of mechanics and programming. Then we can start building out features and improve on them. Doing mini-problems and lessons that were skill-level appropriate would have allowed everyone to be more engaged. 4. Time was not used efficiently during sessions. There was no sense of urgency among the kids. As a coach, I would probably set up a more competitive/timed environment to keep the kids more focused. There were goals for each session, but the focus was not there. During the competition, there was definitely focus. I think that was due to the competitive nature of the competition and the strictly timed schedule. During practice sessions, there was no consequence to socializing instead of getting work done… (Well.. the consequence was discovered at the competition…) Practice sessions could have been engineered to get more out of the kids every time. Good lessons learned. Next time – we’ll all do better.